From the end of April to the beginning of May is the week when Japan has several national holidays. An elegant procession from the picturesque Heian period. The Aoi festival is one of the three largest festivals in Kyoto and is an important anuual festival of both Shimogamo Shrine and Kamigamo Shrine. The festival’s official name is the Kamo Festival and it began in the mid-6th century when Emperor Kinmei ordered a ceremonial festival to be held in an attempt to end a serious famine. Aoi are the hollyhock leaves which decorate everything in the procession from the costumes of participants to the oxen pulling the carts. 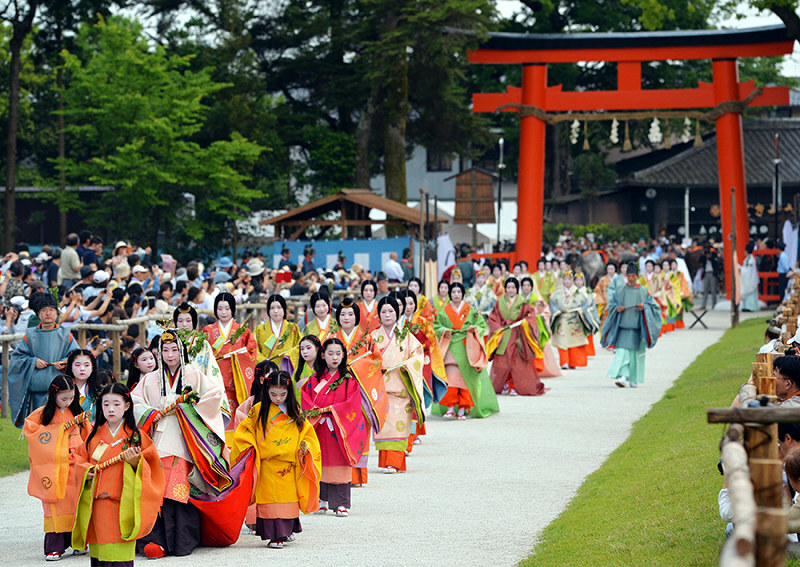 The highlight of the festival is th huge, elegant procession that departs from the Kyoto Imperial Palace and proceeds to Kamigamo Shrine via Shimogamo Shrine (on May 15th). Consists of over 500 people, about 40 horses, 4 oxen and two oxcarts. In Kyoto, approximately 10,000 taxis are in operation every day. Probably, you might be surprised to see the taxi doors open and close automatically and a driver wear formal uniform (sometimes even a cup). The drivers are extremely polite and sometimes will come out of the vehicle to greet you.